Now being processed. Fingers prints, mug shot.. He will be transported to court. 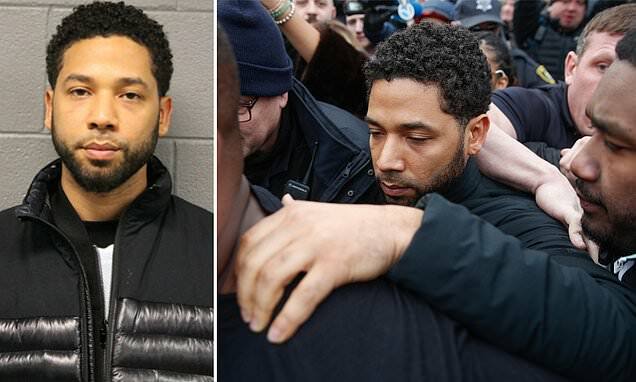 Jussie Smollett headed straight to the Empire set to beg his cast mates to believe he did not stage a race hoax attack on himself hours after posting $10,000 bond and agreeing to surrender his passport at a court hearing. The actor, scheduled to film scenes for the show Thursday, keep cast and crew waiting for at least 30 minutes, TMZ reports. Sources say it was obvious Smollett had been crying so producers then told him come back later. 20th Century Fox have not yet decided whether to suspend or fire Smollett, who plays Jamal Lyon, the son of music mogul Lucious Lyon. The studio is said to be 'considering its options' in light of his arrest. Hours earlier they had said they stood by the 'consummate professional' and furiously denied claims he is being written out of the show, which is in its fifth season and returns to the air March 13. Prosecutors had earlier shared more details of his relationship with the two Nigerian brothers he allegedly paid to stage an attack on him in the hope that it would boost his profile. The actor was hurried out of the Cook County Jail shortly before 5pm on Thursday and said nothing as he fought his way through photographers to get into a waiting car. He was flanked by bodyguards and driven away immediately.